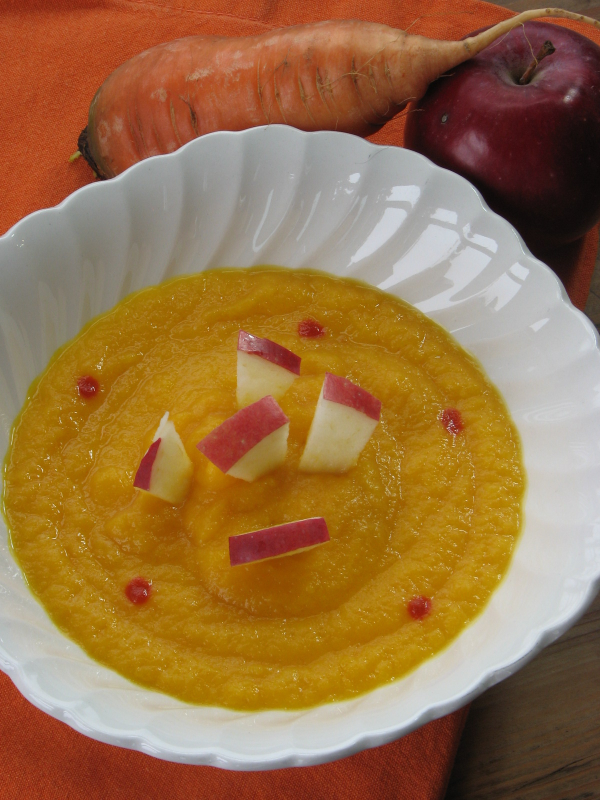 This is week 15 of Reddit’s 52 Weeks Of Cooking challenge. 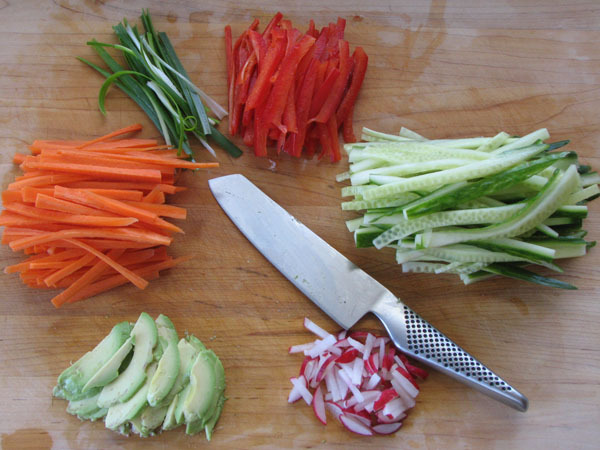 The theme this week is knife skills. When it comes to knife skills, I am just plum lucky I don’t chop fingers off every time I use one. With that said, I was going to do deviled eggs this week. Instead of a straight cut hard boiled egg white, I was going to do a fancy zig zag using a paring knife. Someone in my family(cough cough) thought that was a little lame. When I really thought about it, I agreed, and decided to create something not lame instead. 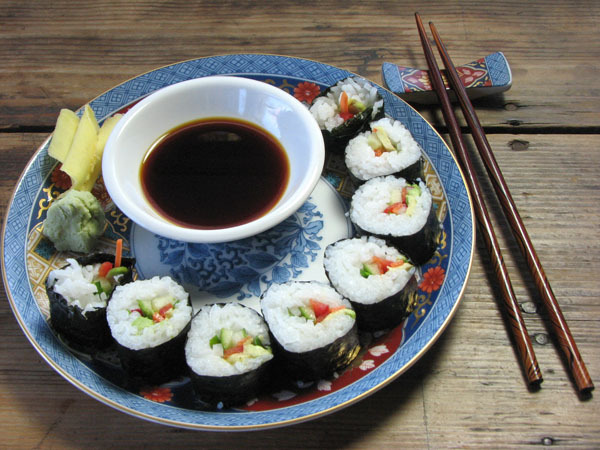 I am dedicating this Vegetarian Sushi post to my darling husband, who inspires me every day. This plate, chopsticks and chopstick holder is part of a set of two and was a gift from our dear Aunt Sue and Uncle Ben Barnes. 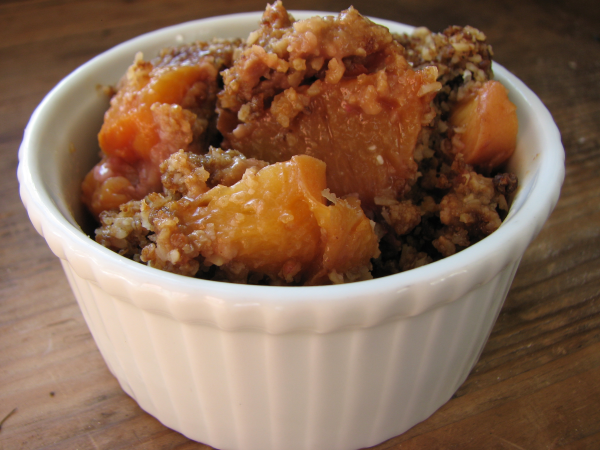 Sue and Ben, thank you again for giving us these wonderful date night dishes. I did not lose a finger slicing these veggies, in case anyone was wondering. Have a small bowl of water, and vinegar handy, so you can wet your fingers for easy rice handling, and spreading rice. My rice was not as thin a layer as I would have liked, but with practice I will get there. 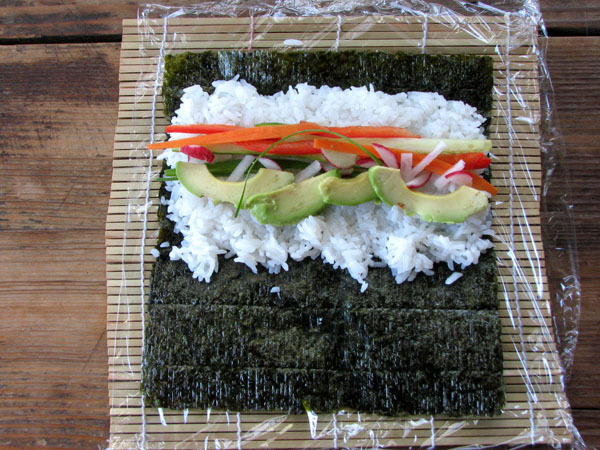 When you are rolling sushi, flip the image above, and have the rice portion closest to your body, and roll away from yourself, as the photograph below shows. 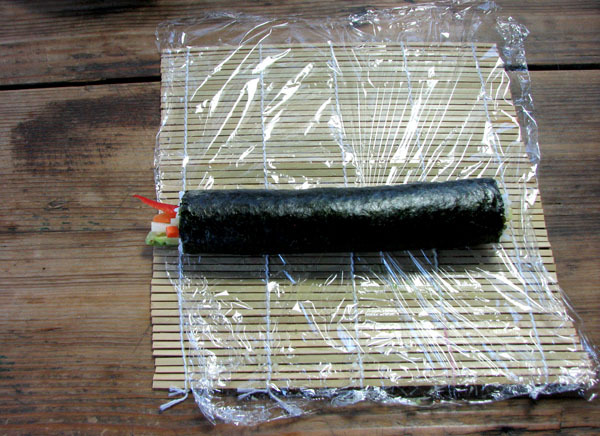 I did not show it but you are going to use the plastic wrap and the bamboo sushi roller to help you roll the sushi. 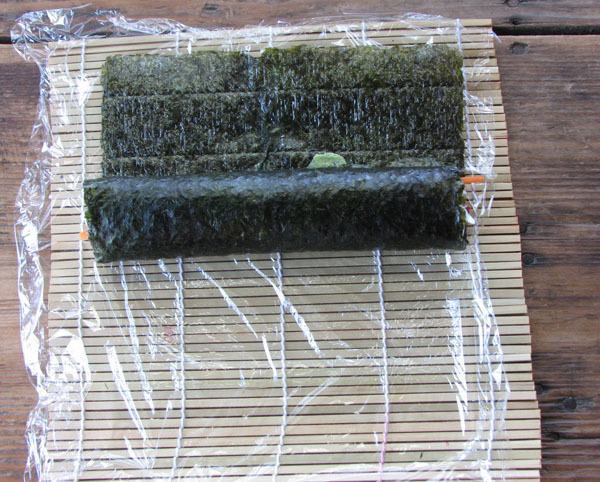 Slightly wet the nori wrap as you roll the sushi, so the nori wrap rolls tightly into itself. Don’t forget to flatten out the plastic wrap so it is ready to use for the next roll. 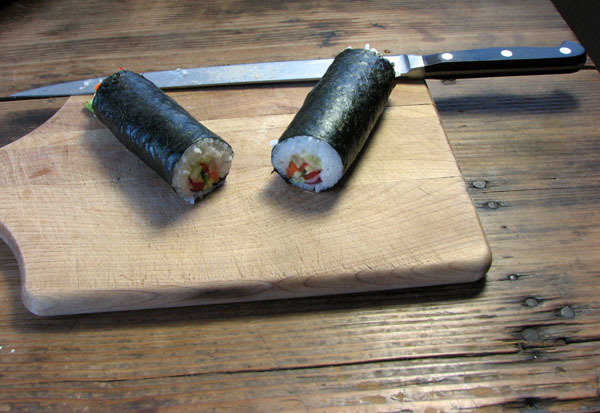 Cut the tight sushi roll in half with a sharp, clean, slightly wet knife. 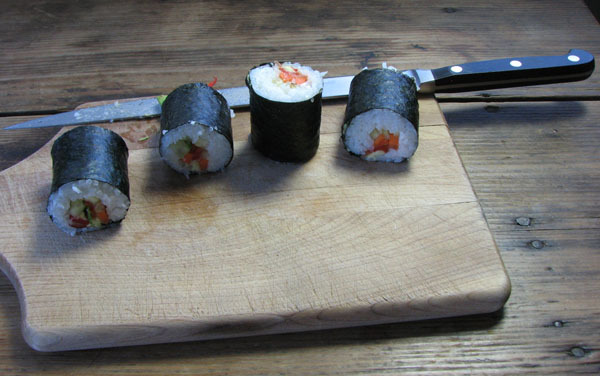 The knife will slice more easily through the roll if it is wet and clean. 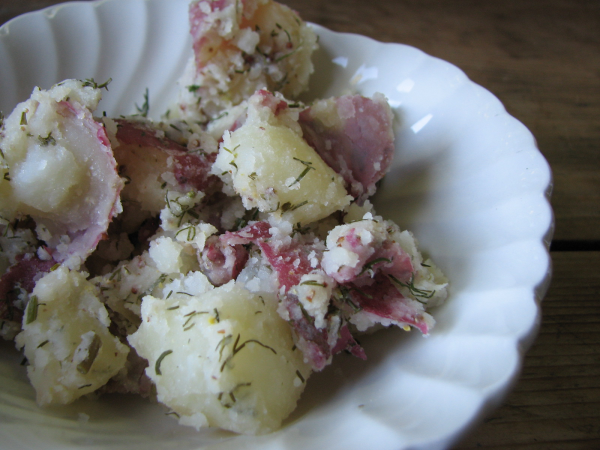 Cut those halves in half to make four pieces. Half these four pieces of sushi again, and you will have eight bite sized pieces as shown in the first picture. I thinly sliced ginger with the grain, and pickled it in red wine, a pinch of sugar, and seasoned rice wine vinegar for two hours. It was very fibrous, and really sharp and spicy, and not completely edible. Next time I will use a mandolin and slice the ginger against the grain and pickle it for at least 24 hours if not longer. I hope I have inspired you to practice your knife skills. 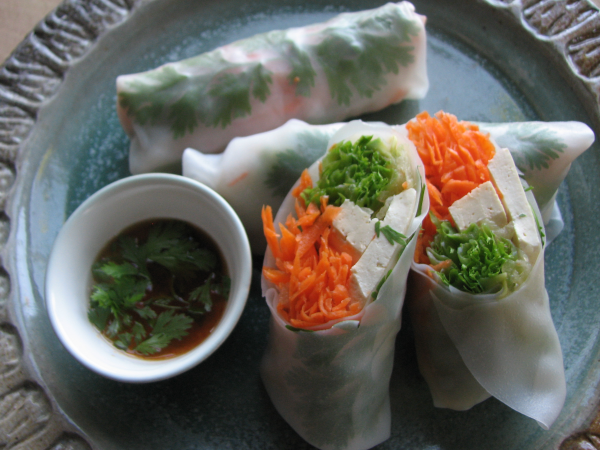 Please make and enjoy this vegetarian sushi with your family and friends.